A creative by trade, Lucie (the brains behind cult Australian jewellery label Babyanything) was destined to plan the perfect Byron wedding with her human of choice, Rory. £I grew up in Byron and we had a house that my mum designed and my grandfather built which was close to our venue, so I felt like it would have elements of my family members there in spirit that are no longer with me explains Lucie. With a short engagement £it felt really quick, just under a year and with Rory popping the question in Hawaii, their wedding was always going to take inspiration from this tropical getaway. 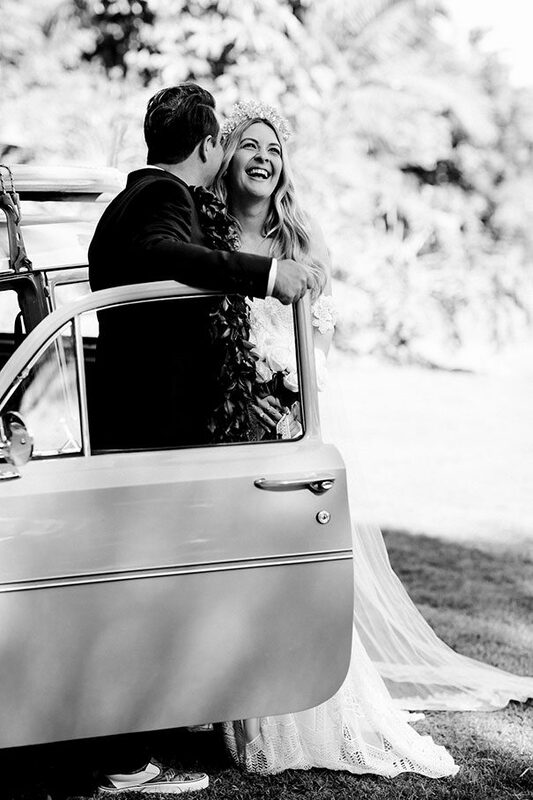 With the all encompassing mantra of Aloha Means Love’, Lucie and Rory say that every single one of their vendors were amazing. As far as standouts go? Your Gourmet and The Events Lounge topped the list, as well as Poppy and Fern who provided some epic florals for the day. £Our flowers from beautiful Jess were magical and the leis were exactly how I imagined. They were traditional hand-strung flower leis, made for each guest, and they were really special to me as I tied them into the ceremony and explained to each guest the meaning of a lei and how it meant each guest was like family to us, Lucie tells us, adding that Casey from Just Love Celebrancy was an all-star vendor as well. £Our celebrant Casey really made everything a dream, she allowed Rory and I to relax and just revel in the magic of finding love. She was so respectful when it came to mentioning our family members who are no longer here and even survived a big car accident on the way to the wedding and didn’t say a thing to us so as not to cause any stress, says the bride who opted for a ravishing Rue De Seine gown from The Bridal Atelier. £My dress was the Fox’ gown from Rue de Seine. When we first got engaged I had originally bought another dress however when we booked The Grove, it wasn’t the right aesthetic. I saw the Fox’ gown on Instagram when I was in the middle of building my retail store. I went to the dress appointment covered in paint and cement with dirty hair and work boots on. When I tried it on though, I knew it was the one explains Lucie, who fondly remembers one moment from the day in particular. £My favourite moment of the day was walking down the aisle. For a moment I knew that everyone there had gathered together to celebrate something beautiful. I had written the ceremony just days earlier and hearing our beautiful celebrant speak the words was magical. I just let it all wash over me, but seeing Rory hear it for the first time was so special, she tells us, adding that Rory had a few surprises of his own. Lucie and Rory’s NSW wedding was originally featured as our cover story in Issue 16. Search for your nearest stockist via suburb or postcode here, or shop online with Mag Nation or via the HM online store here. CREDITS Photographer Lara Hotz // Event planner and Styling The Events Lounge // Styling direction Lucie Ferguson // Additional Styling help The Grove Styling // Florist Poppy and Fern // Stationery Brent Smith and Shannon Heath Studio // Printer D & D Letter press // Ceremony and Reception Venue The Grove // Photography Venue The Atlantic Byron Bay // Catering Your Gourmet // Celebrant Casey McBeath //Guest Transport Byron Bay Double Decker Bus // Bar Austream Affairs // Cake Rebellyous Cake Co // Cake florals Poppy and Fern // Decorative Elements KLF Design, Brent Smith, Mctavish and Maywood // Prop and Furniture Hire The One Day House Rentals, The Grove Styling, The Palace & Co, Byron Bay Pavilions, The Borrowed Nursery, Love & Protect, Hampton Event Hire, Dos Ombre and What she said Co // Teepee Byron Bay Tipi Weddings // Lighting and Sound Hire North Coast Events // Rings Babyanything // Bridal Gown Designer Rue De Seine // Purchased From The Bridal Atelier // Veil Katie May Los Angeles // Robes Spell and the Gypsy Collective // Shoes Ceremony shoes Schutz Via Bone Drag, Reception shoes Chloe // Hair Ash Croker // Makeup Ashlea Penfold // Bridesmaid Dresses Chloe // Bridesmaid Shoes Yeezy // Bridesmaid Gifts Babyanything // Suit Palzileri Italy // Shirt Thomas Pink // Cufflinks Givenchy // Shoes VANS //Socks Calvin Klein // Brides gift to husband All My Relations // Barber Phoebe Barrett // Groomsmen Suits Palzileri // Groomsmen Gifts INSIGHT via General Pants.